Barbecue gas – butane or propane? 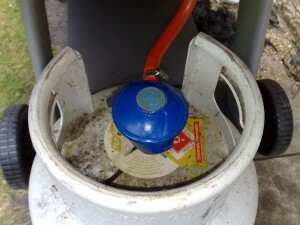 by admin • 05 May 2009 • Comments Off on Barbecue gas – butane or propane? Buying a gas barbecue can be more than a little complicated. You think you have worked out what you want, then you discover there are two types of LPG (Liqueified Petroleum Gas) – Butane and Propane. Not only that, but the gas bottles come with different sized valves. And what on earth is Patio Gas? Butane was more commonly used for barbecues than propane at one time but the situation appears to have reversed in recent years. In fact many, if not most, barbecues can use either butane or propane depending on the regulator valve fitted to the barbecue. Most barbecues now come fitted with a red propane regulator as standard. But is one gas better than the other? For comparison, natural gas – as delivered to millions of homes via the gas mains – has the chemical formula CH4. When burnt, a cubic metre of natural gas will provide 38 Megajoules of energy. Propane, chemical formula C3H8, produces 96 Megajoules of energy per cubic metre. Butane, formula C4H10, produces 126 Megajoules of energy per cubic metre – far more than either natural gas or propane. So butane must be better then? If only life were so simple. Inconveniently butane doesn’t work well at low temperatures. When too cool it stays as a liquid and the gas pressure drops. That means a butane gas cylinder will produce lower pressure once the bottle temperature drops below 10 degrees C. The bottles actually get colder in use, as heat is removed from the bottle when the liqud butane boils into the gas that comes out of the regulator. The higher the rate you use gas, the colder the bottle gets. Use it too fast in cool temperatures and the gas pressure can drop significantly. On one level it doesn’t matter – who wants to barbecue in chilly weather after all? How about someone who has suffered a power cut due to snowstorms? A given quantity of butane will burn hotter than propane but in fact propane regulators release the gas at a higher rate to compensate. In fact many people will tell you that propane burns hotter. Both gases are heavier than air, which is one reason why barbecues have holes in their bottoms. If they didn’t, any leaking gas, (for example from a burner that has blown out) would build up in the bottom, ready to explode in the face of someone lighting the barbecue. Gas bottles come in a variety of different sizes and, confusingly with different regulator fittings. The clip-on regulators used for barbecues are blue for butane, with a standard internal valve size of 21mm. 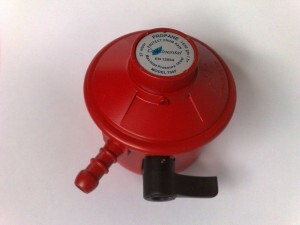 Propane regulators are red with 27mm in internal size. That means that it is not possible to connect to a propane bottle using a butane regulator or vice versa. Typical bottles sizes vary from 3.9 kg to 13 kg but note that those are the weights of the amount of gas in the bottles, not the total weight. The total weight of most bottles is around three times the gas weight, so a 13kg bottle may weigh as much as 40 kg! BP have started selling Gas Light bottles which are made of glass-fibre reinforced plastic. They are translucent so it is possible to see how much liquified gas is left in the bottle. Needless to say they weigh a lot less too – around half as much as a steel bottle. Oh by the way Patio Gas – it just seems to be a marketing term for propane. It will work in both barbecues and patio heaters at all air temperatures, so is a good general-purpose bottled gas that is useful for all the gas-powered devices that are in common use on patios. For information about the differences between gas and charcoal barbecues see Garden barbecues – charcoal or gas?.